In order for regular and editor-level accounts to be able to create (regular accounts only -- that can also be set as group-level admins) and edit guides in a group, their account must be given access to the group. When a new group is created, all regular and editor accounts have no access to it (while all admin-level accounts have access to all groups). Access to a group can be controlled in two locations: in the group's settings or from the Manage Account page for each individual account. Go to Admin > Groups from the command bar. Click the Edit Group () icon in the Actions column for the group you want to customize. Go to the User Access tab. From here you can add new users to the group and manage existing access levels. Click the Add Users to Group button to add a new regular or editor-level account to the group. On the Add Users to Group modal, select the accounts to add from the Users dropdown. When new users are added, their access is set to Regular by default. For non-admin accounts that have access to the group, you can customize their access level via the Level column. Regular accounts can have their level set to Admin, Regular, Read-only (for Internal groups only), or No Access to remove them from the group. Editor accounts can have their level set to Regular, Read-only (for Internal groups only), or No Access to remove them from the group. Note: only admin-level accounts and regular-level accounts with admin permissions for the group can customize the group's user access settings. Access to all group's in LibGuides CMS can also be managed for each individual, non-admin account. Go to Admin > Accounts from the command bar. Click the Manage Account () icon in the Actions column for the account you want to change. 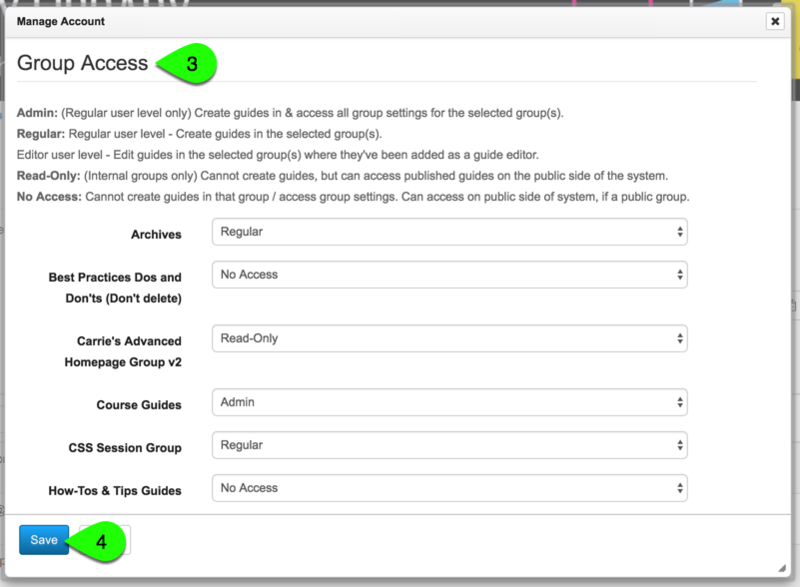 On the Manage Account modal, scroll down to the Group Access section and set the proper access levels for each group. Each group has its own separate set of permissions, allowing you to give certain levels of access to different users. For example, you could give a Regular user access to one group but not another. 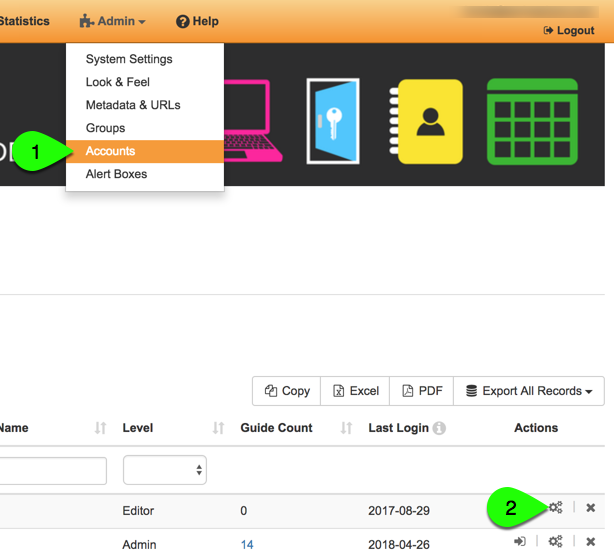 Combined with a user's LibGuides account level, group permissions determine just what a user can and cannot do in a group. The table below summarizes these permissions. Add guides to the group? Edit guides in the group? Please note that Admin users automatically have Admin access to all groups in your system. It is not possible to remove an Admin user's access to a group; however, if a group is Restricted with IP-address access rules, you can prevent an Admin from viewing and editing the group's guide's if their IP does not fall within the allowed range(s). Keep in mind, however, that Admins can always edit or remove these IP access rules at any time. If you have confidential information or documents you do not want all Admin users to see, therefore, consider uploading the files to a platform like Google Drive, Dropbox, or OneDrive, which have more restrictive file sharing controls. You could then link to those files or folders from a guide in your Internal group. Example #1: Jan is the archivist. She has a regular account in the system. Jan needs to manage and update the guides in the Archives Group. She can tweak settings for the Archives group, but not for others. She has Read-Only access to the Staff Intranet, Regular-level access to Course Guides and No Access to the Writing Center. Example #2 : Mike is the Coordinator for the Writing Center. He has a regular level account in the system, and Admin access to the Writing Center Group, but No Access to Archives or Course Guides and Read-Only access to the Staff Intranet. Example #3: Sally is in human resources and runs the Staff Intranet. She only needs Admin access to that one site. She is a Regular Level user for the system and Admin for the Staff Intranet Group. She has No Access to the other Groups.